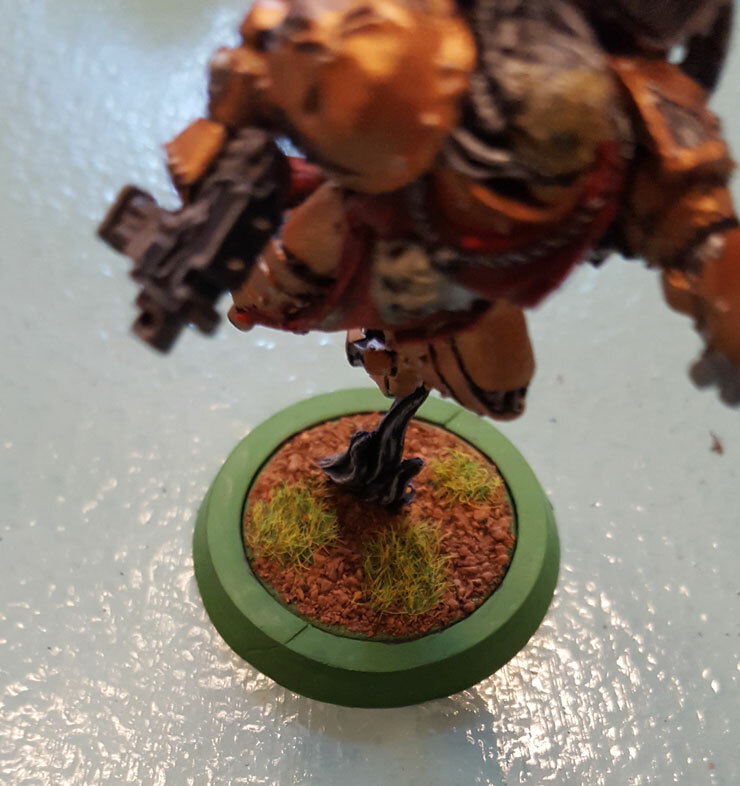 With the ongoing shift in base sizes for Warhammer 40,000 armies in power armor, those of us with older armies face a bit of a dilemma; do we pull our marine models off their old 25mm bases and glue them on new 32mm bases, or do we continue to play with models with the smaller bases, even as we add new models with the new, larger base size? And what of older, metal models in our collection that went into slotted bases. You can’t just rip them off the old base and glue them to a new base. Well, not easily at any rate. Enter the base adapters. A few different companies are making conversion adapters for older bases. These adapters are fitted and glued around the old bases to bring the bases up to the new 32mm standard for marine infantry units. As of this writing, not all marine-style model lines have been updated to the new standard (e.g., Chaos Space Marines), but GW seems to be going through and updating unit boxes one at a time. Being a bit of a cantankerous old grognard when it comes to new things in 40K, I initially planned on just leaving my Chaos Space Marines on the old 25mm bases. 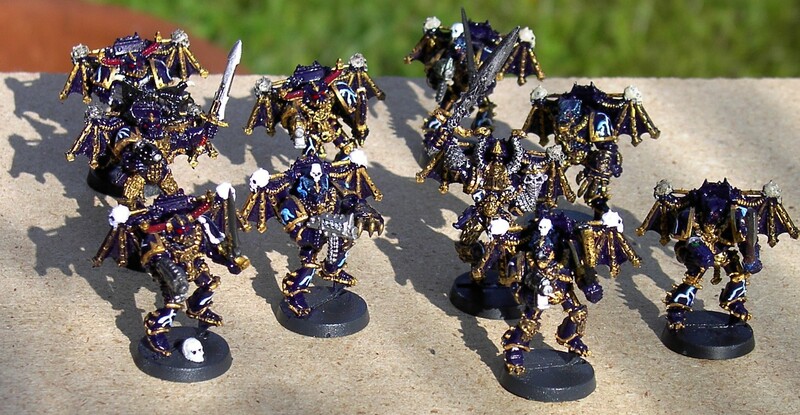 But after seeing some of the loyalist marine models with the new bases on the tabletop, and thinking about how some of my old Chaos Space Marine infantry models suffer from WMS (Wobbly Model Syndrome), I reflected that a change might be in order. I selected the adapters produced by Eccentric Miniatures as the ones I would use. They have a pretty good deal going, with 100 coming in at about $27 USD ($22 + $5 shipping). So that’s what I bought. One other detail is important here: I chose the “A” version of the adapter rings offered by Eccentric Miniatures as those have a tighter fit than the “B” version also on offer. 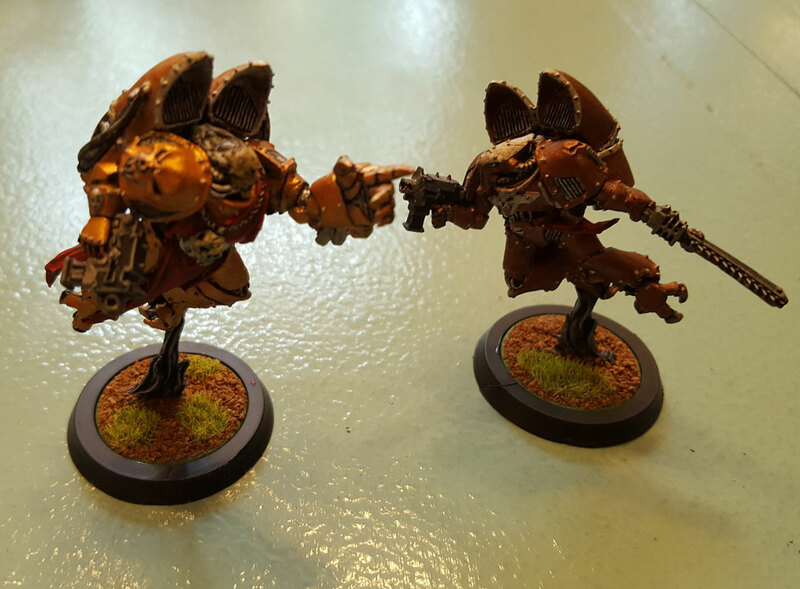 When the adapters arrived, I decided to test them out on a couple of my Chaos Raptors, the poster boys for WMS. If you are not familiar with the older (but not the oldest) version of the Chaos Raptor models, they are metal and the models connect to the base from one of their feet on a relatively thin pillar of smoke or flame. As you can imagine, this makes the Raptor models insanely top-heavy. If they are placed on even the tiniest incline, they will most likely fall over. That said, on to the adapters. The first thing to examine with these adapters is how they appear on the sprue. 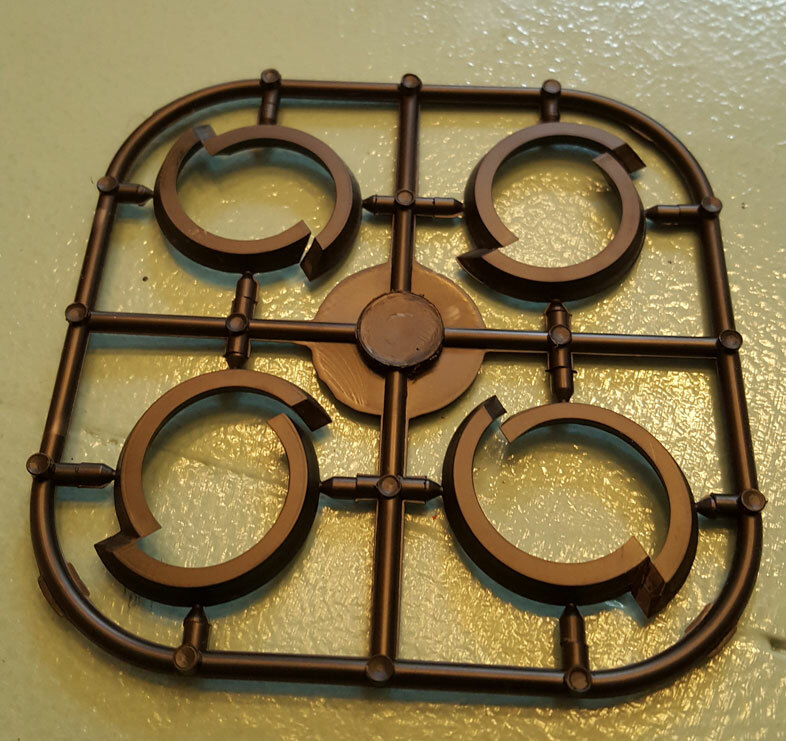 There are four full adapter rings on each sprue, with each ring comprising two halves. The halves join at two tapering surfaces. The adapters clip from the sprue just as any other model parts do. 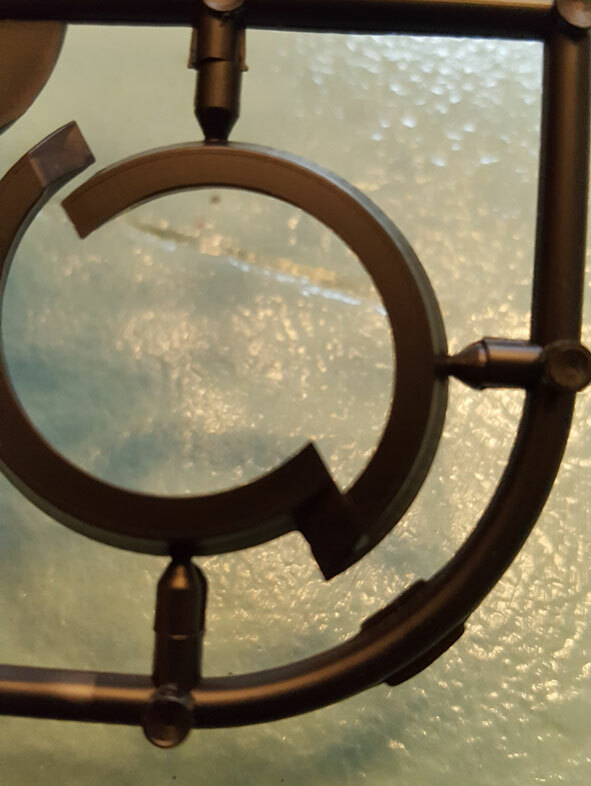 However, the two halves are not actually separated; a thin connecting bit of plastic holds them together, probably to make them less fragile on the sprue. So you have to use a hobby knife to separate the halves once they are off the sprue. As with other model components, you’ll also need to do a bit of clean-up with a hobby knife or files to get rid of other surface imperfections. I ended up gluing one half of the ring on the base first, making sure it was in proper alignment. I then glued the other half on. There is a visible seam at the two joints and a little filing can help reduce the visibility of this seam. Also, as you can see in the pictures, there is a visible gap on the topside between the base and the adapter ring. On the underside this gap is non-existent. However, the topside gap is not really a problem as we shall see later. Once I had adapters on my two test models, I could immediately tell a difference in stability. This is not to say the models no longer have WMS at all, but it was greatly attenuated. 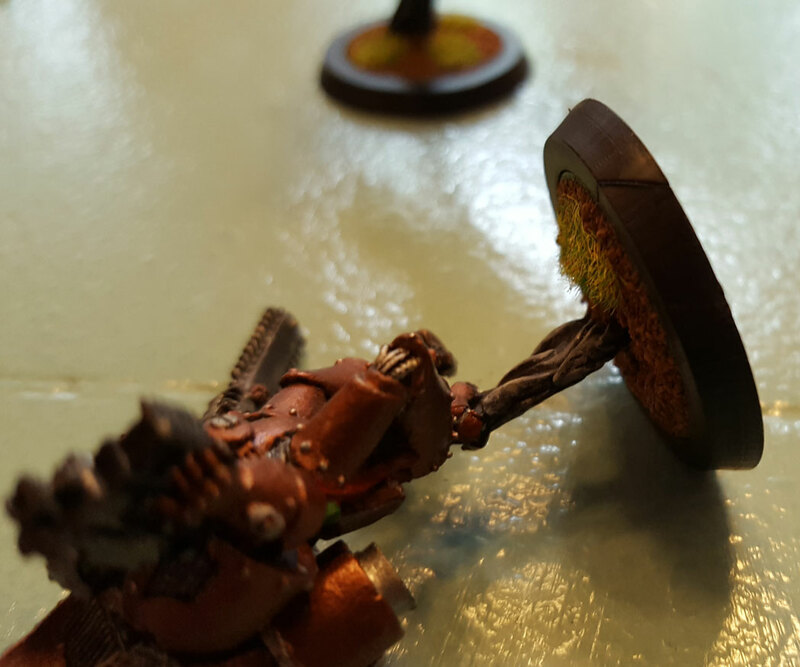 I then broke out my old pot of Goblin Green and painted the adapter ring. A coat of paint really helped make the joint seam less noticeable. And finally, I added ballast on top of the ring, which completely covered up the topside gap. In fact, you’d really have to be really looking now, or look at the base underside, to tell an adapter ring had been added. 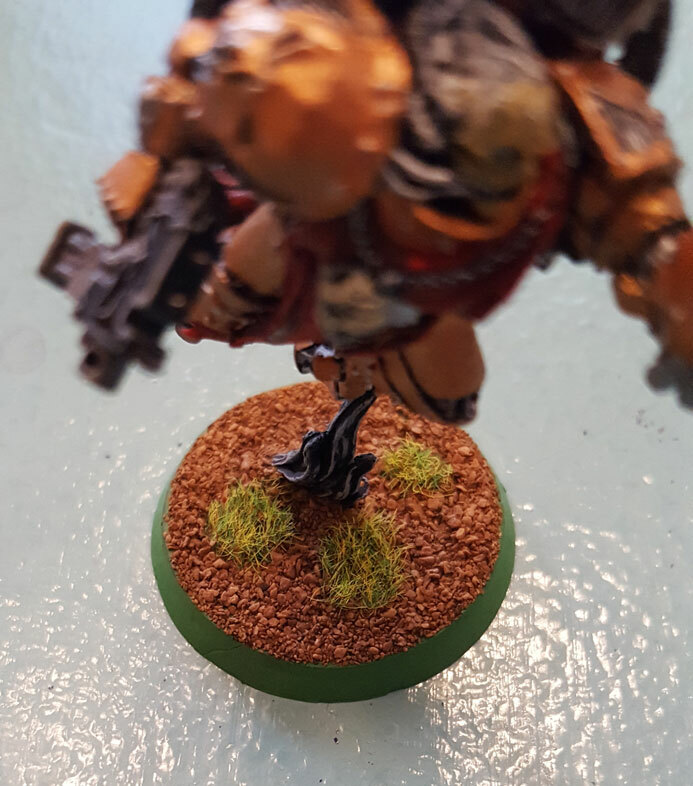 A casual glance as you’re playing on the tabletop would yield no difference from the new bases. Overall, I’m very pleased with these adapters and would recommend them to anyone interested in updating the bases of his older marine models. They are easy to put together, look good, and are available at a pretty good price point if you buy in bulk. If you only need a few, I would suggest splitting the cost among one or two other friends who might need them. After the Raptors, I’ll probably add the adapters to my Khorne Berzerkers and Possessed, as both lines of models tend to have some degree of WMS. I’ll report any wrinkles that come up in those endeavors.